Have you recently noticed those red or blue spiderweb-looking veins marring your face or legs that are probably preventing you from wearing shorts, or forcing you to put tons of make-up on your face? Don’t worry, you’re definitely not alone! What you are most likely suffering from is called Spider Veins, also known as Telangiectasias. These groups of small blood vessels can be seen very close to the surface of the skin. They will most likely affect either your legs or face, but theoretically they can appear anywhere on your body. Spider veins are caused by the same pathophysiology as varicose veins, and heredity, pregnancy, aging, and sun damage are seen as huge contributing factors. In most cases, some mild form of venous insufficiency is also involved. Venous insufficiency is usually related to poorly functioning vein valves. You need your vein valves healthy because they allow blood to flow from the legs toward the heart against gravity, preventing venous reflux (reverse flow). If the valves are damaged or the vein wall is too weak, the blood pools in the legs, which results in the formation of spider veins (or even worse – varicose veins). Is this common? Absolutely. Spider veins are a problem that bothers millions of people around the globe. The name comes simply from their resemblance to a star with multiple small veins radiating from a center, sort of like when a spider is weaving its web. In North America, estimates say that more than 40 percent of women have some form of vein condition, and by the age of 80, 80 percent of women have some form of vein disease. This makes problems with veins one of the most common chronic conditions – and spider veins are often how they start! What causes spider veins to happen? Heredity – family history of vein problems, as well as being born with weak vein valves increases your risk. Obesity – being overweight puts extra pressure on your veins, which can lead to spider veins, or even worse, varicose veins. Gender – females are affected 4 times more frequently than males. Birth control pills – taking birth control pills, as well as other hormonal changes during puberty, pregnancy or menopause can contribute to the formation of spider veins. Pregnancy – the soon-to-be offspring puts great pressure on the veins. More spider veins usually occur with additional pregnancies. Blood clots – in the case of blood clots, spider veins are usually associated with a more serious health problem. Trauma or injury to the skin. Increased abdominal pressure (tumors and constipation). Ultraviolet ray exposure – prolonged sun exposure can cause spider veins on the cheeks and nose. As you can see, even something as trivial as a bruise from the gym or getting a tan on the beach can result in the development of spider veins. And let’s be honest, which one of us doesn’t try for that bronze skin every once in a while? Unfortunately, spider veins are sometimes related to venous hypertension or even more serious systemic conditions such as rosacea, scleroderma, carcinoid syndrome, etc. That’s why spider veins are not solely a cosmetic problem, and if they appear out of the blue, they need to be checked by a specialist as soon as possible! Unfortunately, yes. Spider veins don’t get better on their own and will usually get worse over time regardless of whether they’re affecting your legs or your face. The sooner they are treated, the more effective, less complicated, and possibly cheaper the treatment will be. This is certainly not what you want to look like, so don’t wait around. Start treating spider veins before they get worse. 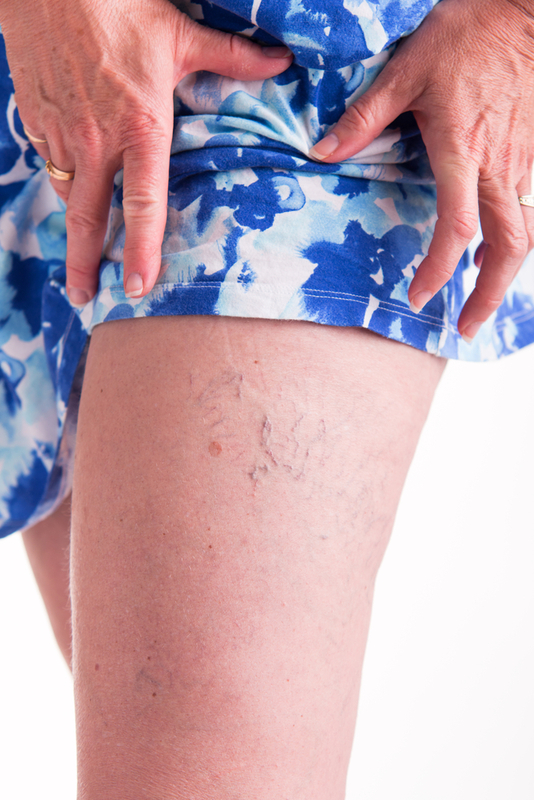 Thanks to modern technology, treating these unsightly veins has become much easier. The new procedures don’t require surgery and have little to no downtime. Skilled specialists will treat the veins in their office with either a laser, a salt/chemical solution called a sclerosant, or a combination thereof. You’ll be back at work on the same day, with relatively little pain or discomfort. Laser Therapy – this minimally invasive procedure is the most effective treatment for spider veins. It’s easy, fast, and usually pain-free. Performed in outpatient setting, with no general anesthesia and quick recovery, this is a great solution for your face – it is extremely gentle and thus suitable for the sensitive parts of your body. Sclerotherapy – this minimally invasive procedure involves injecting a salt water or a chemical solution into the vein. The vein then hardens and disappears. Outpatient setting, no anesthesia, low cost, and almost zero downtime or risks make Sclerotherapy a perfect solution for spider veins. You can also find a medical specialist – phlebologist or dermatologist – who will perform a physical examination using various technological devices. You can use our Find a Doctor locator to find a medical clinic or group that specializes in vein-related conditions and treatments with lots of experience and latest laser technology. Don’t hesitate to call to ask some questions or schedule an appointment to ensure the best results. Remember, it’s better to be safe than sorry with any procedure performed on your body. You can just call and schedule an appointment to get any specific answers. All of these offices are state-of-the-art and the staff is very friendly to their patients. Without maintaining healthy lifestyle and seeking potential treatment, spider veins tend to get worse over time. Hardly anything can be done about your age or genetics, but you can certainly work on slowing down the development of spider veins and managing the symptoms through regular exercise, proper hydration, healthy diet, low blood pressure, wearing a compression stocking, and avoiding prolonged sun exposure. These are all aspects you can control yourself on a daily basis. Help your veins work as properly as possible and you will be rewarded with smooth skin and perky, untired legs. Elevate your legs above your heart as many times a day as possible for at least 15 minutes at a time. If you are overweight, change your diet and try to lose some of the excess weight. Exercise regularly! Physical exercise helps the blood flow and strengthens the deep muscles necessary for your vein valves to work properly. Walking, swimming, and yoga can be great options. Avoid prolonged sun exposure – the most common cause of spider veins on the face.